Policymakers and the media should avoid using terms such as "drug user", "addict" and "junkie", a report by a group of former world leaders has said. The Global Commission on Drug Policy has drawn up a checklist of what language should and should not be used. It said negative language presented people who use drugs as "physically inferior or morally flawed". Its members include former UN Secretary General Kofi Annan, Sir Nick Clegg and the entrepreneur Sir Richard Branson. The Global Commission's latest report advises political leaders and journalists to use the expression "person with drug dependence" - not "addict", "drug abuser" or "junkie". It also said it was preferable to refer to a "person who uses drugs" rather than a "drug user" - and to avoid calling those with non-problematic drug use as "recreational, casual or experimental users". The report cites UN Office on Drugs and Crime estimates that a quarter of a billion people aged 15-64 used then-illegal drugs in 2016 - of which nearly 12% were considered to suffer problematic drug use. It said it acknowledged the "negative impact" of some drug use but added that prohibitionist policies "increased stigma", telling political leaders not to "stoke fears" about drug use. 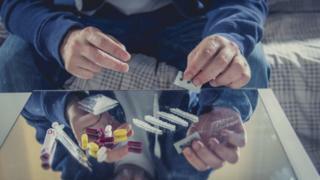 It added that current laws treated people who use drugs as "sub-human, non-citizens and scapegoats for wider societal problems". The group, which includes 12 past presidents and prime ministers, has consistently called for substances including cannabis, heroin and cocaine to be legalised and regulated. Former deputy prime minister Nick Clegg has long called for UK drug policy to change, saying that the so-called "war on drugs" was not working and that addicts needed support instead of a criminal record.